Thanks for the email, Chris B.! Props also to Robert Montoya for helping with the writing and research on this one. Somehow, I don’t think I had ever heard of Bishop Berkeley before fielding this question. It’s nice to have a wide receiver you can defer these things to. Increasingly, I’ve been abandoning the single-player version of Minecraft to build cooperatively with my internet friends. Gryfft has set up a server and named it “Zomboland,” after a certain webpage where you can do anything. And indeed, you can do anything in Zomboland! You can explore the mountains and caves, build towers, mine for gold, fight zombies and giant spiders, or whatever else you imagine. 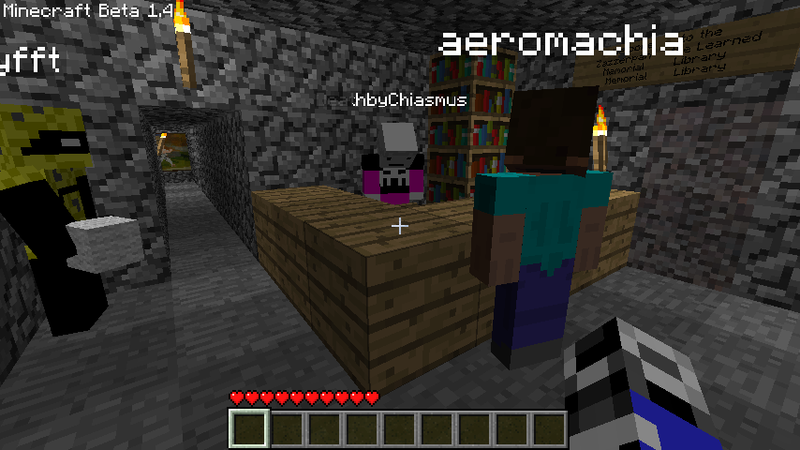 In Minecraft, you define your own experience, and it’s so much more fun to do so with friends. 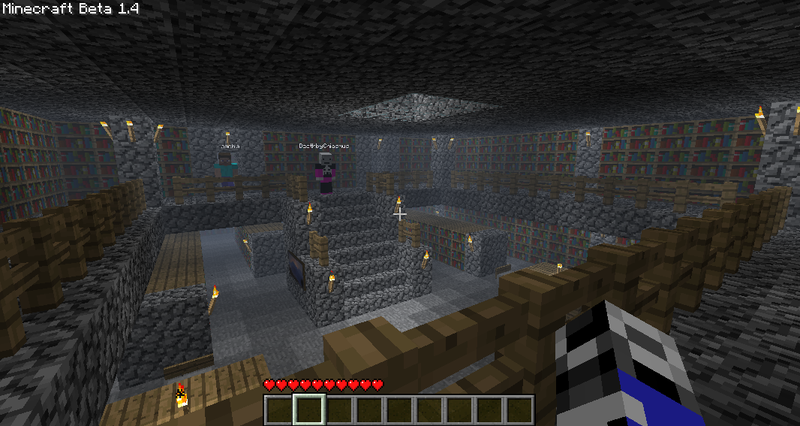 A month or two ago, I undertook a new building project, the Zazzerpan the Learned Memorial Library. Named after a certain fictional wizard, it was going to be a symbol of the ceaseless joys of bewonderment. Unfortunately, a server crash eradicated several days’ worth of work, and when I saw the setback, I lost all motivation. The half-finished husk of the Libe remained, incomplete and vacant. But then I got to work. Deep underground, I began building again, harvesting reeds in an underground reed vault. Caverns were excavated, trees felled, reeds pressed into pages and pages of books. And Friday, April 1st marked the Grand Opening of the Zazzerpan the Learned Memorial Library Memorial Library.